Fritz Enzinger is Head of LMP1 at Porsche. In Weissach he and about 200 employees are preparing the return to Le Mans. A portrait. With a fresh sheet of paper: that's how Fritz Enzinger started in Weissach at the end of 2011. The graduate mechanical engineer lists the tasks at hand: "The chance of starting such a demanding project from scratch, creating the organisational structure, setting up a team, putting the processes in place to create a totally new race car in one company – that is a dream." He talks fast as he has no time to lose. Accordingly, the name of his project is short: LMP1. It is simple to read, but is nevertheless spectacular. The acronym means the Le Mans Prototype Category 1. That is the category where the teams drives to obtain overall victory and have what it takes to make legends. When Enzinger started in Weissach, 15 employees were assigned to the project and two buildings in the planning stage. In the middle of 2013, the targeted work force of 200 was reached. "At the beginning we were spread over four buildings," Enzinger remembers. "But that's not how you build up a team. We then worked for three months in a container. It may have been a simple container but at least we were all together." The Austrian knows motor racing from all perspectives. After finishing his studies, he started as chassis engineer at BMW in 1981 where, five years later, he switched to the motorsport department. He stayed there for 25 years. Originally from Styria in Austria, he looks after the things he likes. He has held management functions in a wide variety of projects: touring cars, sports cars, Formula 1 – purchasing, logistics, sponsoring and networking. He has a thorough understanding of how motorsport works: technically, politically and in competition. Finally it was the blank sheet of paper at Porsche that enticed him away from Munich. "If you want to top BMW, it has to be Porsche," he says, compressing his brand philosophy into a nutshell. What fascinates him about motor racing is its complexity and measurability. "There are no details which are unimportant," says Enzinger knowingly. "You cannot neglect anything. You have to keep an overall view of everything. The underbody must be right, and it needs backing from above." The project devours him but he totally grew into it. It took months before he could see daylight for the first time from the terrace of his furnished flat. The overriding interest is to achieve technical synergy for series development. Team spirit is not only the golden rule on the race track. The LMP-1 project involves many teams who together form a large team. With clear responsibilities. "Each person must sit at the place she or he is most capable of filling and where she or he feels the most comfortable. Otherwise we just waste energy." His glass office door is always open and therefore fits to the person who sits behind it. Enzinger manages without conceit. Trust and loyalty are more important to him. He started in Weissach with two major aims: first to set up an optimised organisation for the company to return to the top category of the sports car world championship. 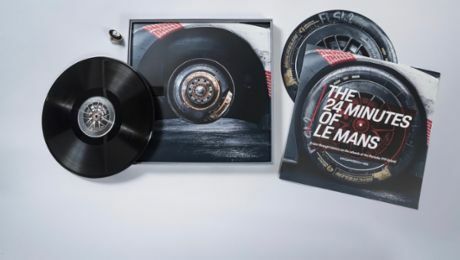 Second, to win as soon as possible with Porsche in Le Mans. "We have managed to create the preconditions. Now we must deliver," he knows. In June 2013, the LMP-1 prototype had its roll-out in Weissach. Since then the test programme for the Hybrid 919 has been under way on international race tracks. The absolute highlight of the World Endurance Championship (WEC) is the 24 Hours of Le Mans on June14 and 15. "In view of the competitive situation it will be a 24 hours sprint," says Enzinger referring to the commitment of Audi and Toyota. The LMP-1 head acts highly strung. He radiates enthusiasm and passion for the sport with every fibre of his person. Will it always be a question of faster and further? He shakes his head and says only: "Iceland". His favourite holiday destination. His synonym for peace, that's the name of his contrast programme. His now adult daughter imported her passion for horses and got her parents infected with it, too. Horses are now part of the family in Munich. "When I ride out early in the morning on holiday, when I feel the fresh air and the animal, I find peace," says Fritz, the family man. "I wind down and know again what is really important." The salt-laden wind from the sea, the sound of unshod hooves on lava. One horsepower, a perfectly natural form of traction. Enzinger knows his way around horses from the far north. One of his pet subjects is talking about tölting, a unique gait particular to this species. The man has celebrated victories in all touring car categories, in the FIA GT world championship, in Le Mans and in Formula 1. What was his greatest sporting success so far? "That I didn't fall out of the saddle on my first ride." The LMP1 project keeps him at a fast trot. Time is galloping away until the next race. Porsche looks back at three unforgettable motorsports events.